Today wasn’t AS captivatingly beautiful as yesterday. Aside from the almost sub-zero temps and blowing snow the outside looked very similar to a typical January afternoon in Portland; overcast. The mountains didn’t even show up until late afternoon. It is quite a trip to be startled awake at 8:15am by your alarm and it’s still pitch black outside. But eating breakfast and watching the sun rise at 9:00am IS something I could get used to! Because it was a mostly dreary day I didn’t venture from the hospital at all. I’ve been promised short trips to beautiful sights and some pictures of me around town. It’ll happen. It was a great day in the hospital: Lots of opportunity to talk through medical scenarios, talk with some doctors, chat with some techs about life inside and outside of the hospital, and talk about some structure and management-y things with the management team. 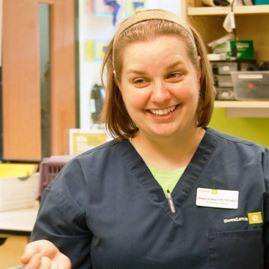 I’ve only worked at two (three if you count Saturday relief for 8 months) hospitals in my veterinary career, but DoveLewis has been through so many changes over the last 13 years that I’ve seen it, thought about it, tried it and changed it. And if I can help ANYONE with the mountain of semi-useless knowledge that takes up valuable space in my brain then I’ll sleep better at night. Today’s lecture topic was shock and critical thinking – two topics near and dear to my nerdy heart. There was some good discussion among those who were there about cases they’ve seen and some new procedures to try. It was a great way to end the day. Even introverted me is having a great time with this crew. All of them are happy to talk to me, answer my endless questions about their job and what they’d like to learn, and eager to give me pointers on what I should try to see and do before I have to leave. One of them is bringing me some boots (rated to -60 degrees of protection… but I hope I don’t need that level) to wear on whatever great adventure happens on Saturday. I’m pretty sure I’m not going to get out of this state without spending some significant time on a snow machine (that’s Alaskian for snowmobile).